WRM Motorcycles started in 2004 based on years of experience in the carbon fiber materials and in MX1 Grand Prix racing departments. The passion for motocross created a revolutionary concept bike where Carbon Fiber and Kevlar are used in a new way never seen even in a MX1 Grand Prix. Structural parts of the chassis (upper frame and filter case) and the swingarm are completely build of carbon fiber and kevlar. 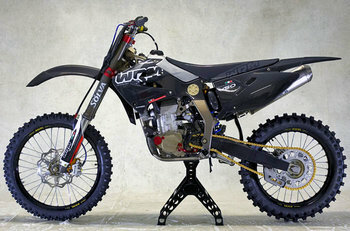 Only the WRM 450 MX1 has these new parts and design. Tank, Valves Cover Engine and a most of the accessories are made with hi-tech composite materials. The engine was designed, tested and manufactured completely by WRM.